So begins one of the most beloved stories in all of history. 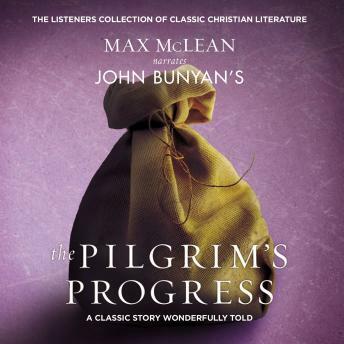 John’s Bunyan’s beautiful and moving allegory of Christian, the Pilgrim, on his perilous journey to the Celestial City, has touched hearts and minds for more than three hundred years. Filled with unforgettable characters—Evangelist, Charity, Hypocrisy, Goodwill, Obstinate, and Mr. Worldly Wiseman—this wonderful story offers a unique insight into the Christian life, its joys and trials, its opportunities and struggles. Max McClean’s lively, heartfelt reading is taken from a slightly updated, easier-to-follow text that retains the style and form of the original.